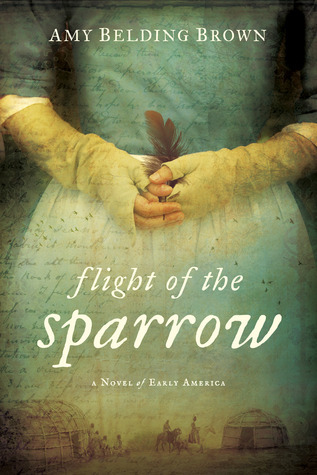 Flight of the Sparrow by Amy Belding Brown tells the true story of 17th century Mary Rowlandson, who survived a Nipmoc attack on the village of Lancaster, MA and was subsequently taken prisoner along with two of her children. After about three months, Rowlandson was ransomed back to the English. She then went on to write a tale of her account, now known as A Narrative of the Captivity, Sufferings and Removes of Mrs. Mary Rowlandson. While Rowlandson’s narrative reflects Puritanical thinking and faith, Brown’s version paints Mary as a woman finding her voice and independence because of her capture. First off – Flight of the Sparrow has a lot of graphic violence. If you can’t handle that sort of thing, I would advise you probably not read this book because it certainly doesn’t shy away from the shocking and gruesome. Overall, Brown’s tale is fast-paced and there are often several chapters that are merely chunks of summarized action which I didn’t particularly enjoy. I prefer a style where the narrative has room to slow down and open up, allowing the readers to live presently in the scenes rather than witness several important events rushing by as merely being glossed over. In simplistic terms, there are far too many large chunks of story that are all tell and no show. Although this stylistic choice was disappointing for me, I will say that there were several moments where I was utterly engrossed. I found myself feeling this way mainly during the months of Mary’s captivity and the time she spends forging relationships with the Nipmocs. There is a beautiful and tender, yet tragic relationship that comes out of this time that will leave you yelling at your book–but I won’t discuss that too much since I don’t want to spoil it. While unlikely the case in real life, Brown’s Rowlandson seems to find her true voice and freedom while enslaved. Her time with the Nipmocs forces her to realize that she was more a slave as a woman within Puritan society and as the wife to a rigid preacher husband. While Mary struggles with her Christian faith after her “redemption,” she finds strength and truth in the compassion and empathy she has for others’ who have been enslaved. In essence, Mary’s eyes would have never been opened if it weren’t for her capture and enslavement. Sometimes, it really does take the act of walking in someone else’s shoes to gain empathy and compassion otherwise lacking.